Your experience with your SSA campus group has laid the foundation for the start of a much broader involvement in the secular community. There are hundreds of thriving community groups across the United States who come together to make friends, serve their communities, engage politically, and deepen their knowledge of the world. The possibilities are endless! Make a national impact! There are dozens of secular organizations in the U.S. that lobby Congress, regularly debate the day’s hot issues on cable news channels, and help respond to natural disasters. American Atheists fights to improve public policy for all Americans, protect real religious freedom by defending the wall of separation between religion and government, and promote the acceptance and understanding of atheists. FFRF strives to promote the constitutional principle of separation of state and church, and to educate the public on matters relating to nontheism. 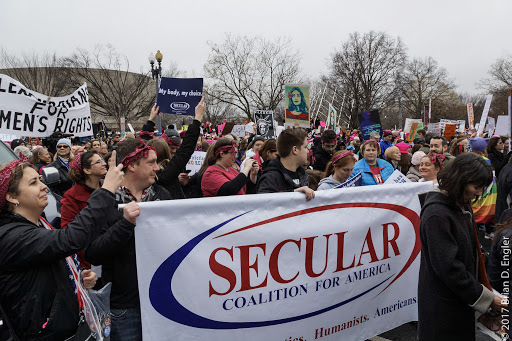 The mission of SCA is to increase the visibility of and respect for nontheistic viewpoints in the United States, and to protect and strengthen the secular character of our government as the best guarantee of freedom for all. AHA advocates for progressive values and equality for humanists, atheists, and freethinkers. Black Nonbelievers provides a community for black nonbelievers (and allies) who are living free of religion and other beliefs and might otherwise be shunned by family and friends. HAFree was formed in the Washington, DC area as a non-profit educational organization to serve as a resource and support to all Hispanic freethinkers. Oasis is a growing movement building a sense of community outside of religious affiliation through human empowerment, intellectual exploration and humanitarian service. Sunday Assembly is a godless community that meets to hear great talks, connect for service projects, sing songs and generally celebrate life. Camp Quest provides an educational adventure shaped by fun, friends and freethought, featuring science, natural wonder and humanist values. Our secular, co-ed summer camps offer week-long residential programs for children aged 8-17 and day camps for children aged 4-8. Guided by the principles of secular humanism, our mission is to unite the humanist community in volunteer and charitable efforts and advocate for compassionate action throughout the world. HSC is an international volunteer program guided by the principles of secular humanism.